Xiaomi Mi Max 2 comes with fingerprint sensor and 6.44-inch Full-HD, IPS capacitive (1080x1920 pixels) touchscreen display. 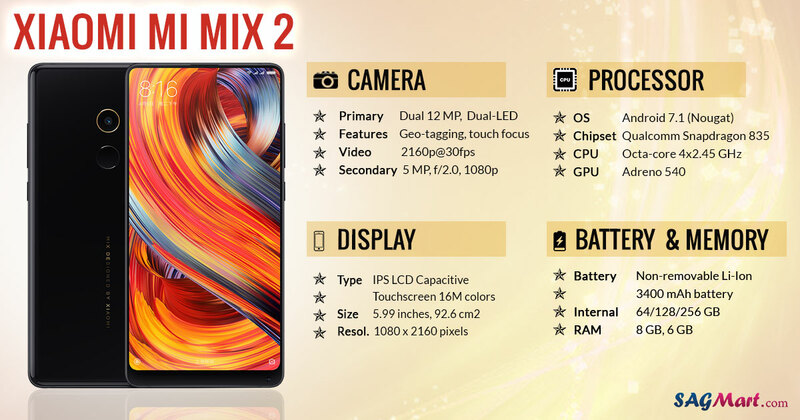 It is powered by a 2.0GHz Octa-core processor with 4GB RAM. The Dual SIM device runs on the Android Nougat 7.1.1 Operating System and 12-megapixel rear camera and 5-megapixels selfie camera. It packs 5300mAh Non-removable Li-ion Battery with fast charging support. The device provides 32/64GB internal memory, expandable up to 128GB using microSD card. On the connectivity front, it offers 4G VoLTE, 3G, OTG, USB Type-C, Bluetooth v4.2, Wi-Fi 802.11 a/b/g/n/ac options. The price, images, video and specifications we have provided, are from our best market analysis and search results. It may vary according to the change in price and discount offers provided by the Company. We are providing the information best of our knowledge and we are not liable for the accuracy of the points mentioned above.